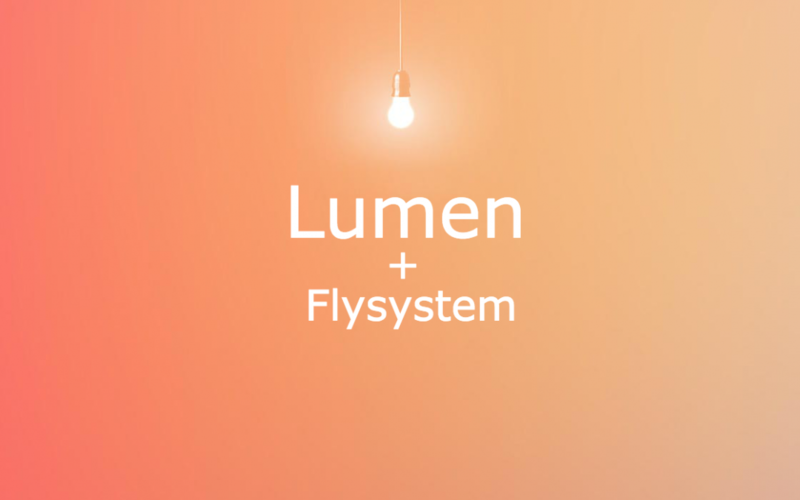 The purpose of this article is to show how to integrate the Flysystem file system library with Lumen framework. It is recommended to use Graham Campbell’s Flysystem wrapper. Let’s begin. Install Graham Campbell’s flysystem wrapper. So go ahead and install the one or ones that you intend to use. After you have installed the Flysystem and the Adapter/s you need to register the service provider. Open up the bootstrap/app.php file and add this line of code somewhere in the middle (i.e. after the $app variable is defined and before it is returned). The Flysystem requires configuration for each of the adapters that you intend to use. To do this first copy the flysystem.php config file from the package. That is copy vendor/graham-campbell/flysystem/config/flysystem.php file to your config folder. Here is what the file looks like. * This file is part of Laravel Flysystem. | connections at once using the manager class. | multiple connections per driver. | Here are each of the cache configurations setup for your application. | per driver as shown. You can now modify the file to set your configuration. You would observe that there are three config options in the config above. This option ('default') is where you may specify which of the connections below you wish to use as your default connection for all work. The default value for this setting is 'local'. This option ('connections') is where each of the connections are setup for your application. Examples of configuring each supported driver are included in the config file. This option ('cache') is where each of the cache configurations setup for your application. There are currently two drivers: illuminate and adapter. Examples of configuration are included. And.. you are good to go! Hope this article was helpful.